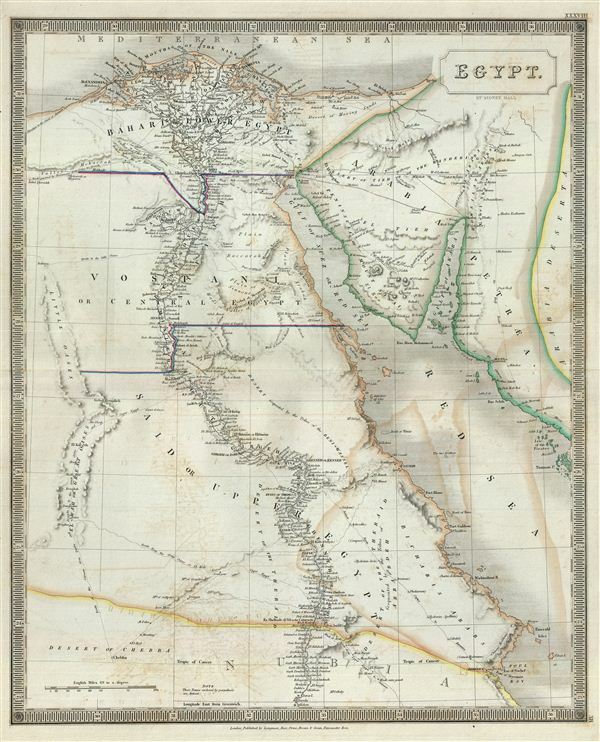 This is a beautiful map of Egypt from Sidney Hall's extremely scarce 1835 New General Atlas. It depicts Egypt, centered on the Nile River from its delta on the Mediterranean south as far as the Desert of Chebba and the Port of Abyssinia and from El-Wah or Great Oases east as far as Naaman Islands. Egypt is here divided in to Mamluk provinces of Bahari (Lower Egypt), Vostani (Middle Egypt), and Said (Lower Egypt). Hall's map notes numerous cities and villages along the river as well as various ancient Egyptian ruins including the Pyramids of Giza and the 'Sepulchers of the Kings of Thebes' (Valley of the Dead). It also offers considerable detail regarding the Valley of the Lakes of Natron with is numerous important Egyptian Coptic monasteries. Various battles between the Ottoman and French forces under Napoleon are noted, including El Arish 1799, Ghizeh 1798, and Aboukir 1798, among others. Near Suez, Hall identifies the Ancient Canal which would soon give way to a more modern variant. Numerous caravan routes are mapped throughout and ancient place names are written in parentheses. Hall prepared that map in the declining days of the Ottoman Empire. After the conquest of Palestine by Muhammad Ali's Egypt in 1832, British intervention returned control of Palestine to the Ottoman rulers in 1840. In Egypt, following the expulsion of the Napoleonic forces by the Ottoman Mamluk Turks, Muhammad Ali, the Ottoman viceroy of Egypt, established the Mamluk dynasty that would rule Egypt until the Egyptian Revolution of 1952. Between 1820 and 1833, Ali annexed northern Sudan, Syria and parts of Arabia into the Mamluk Empire. Rumsey 4224.039 (1830 edition). Tooley, R.V., The mapping of Australia and Antarctica, 2nd ed., p. 92-93, no 687. Philips (Atlases) 758. National Library of Australia, 2113921; MAP F 514; MAP NK 10750/1; MAP RM 741; MAP T 687. Ristow, W., American Maps and Mapmakers: Commercial Cartography in the Nineteenth Century, p. 303-09.